Happy Halloween! While we at SAA were coming up with costume ideas this week, we also ran the numbers on our open water events for 2013. What we found were some frighteningly exciting statistics! Here’s a recap of our open water events for the season- they’re no trick, and certainly a treat! Two NEW Swim Across America Labs! Both our Dallas and Seattle swims hit the $1 million mark for fundraising this year, which is amazing! The Innovative Clinical Trials Center at Baylor Charles A. Sammons Cancer Center was renamed the Swim Across America Innovative Clinical Trials Center after hitting $1 million in giving. In only its third year, SAA Dallas continues to break records and make waves. Over on the west coast, SAA Seattle also hit the $1 million fundraising mark and was recognized by beneficiary Seattle Cancer Care Alliance by naming their lab for us. This is the fifth Swim Across America lab in the country, demonstrating our growth as an organization and the tirelessness of our participants and donors. Our Babes are Getting Bigger! A couple of our very new swims completely blew us out of the water this year. Atlanta is the youngest of the open water siblings, and this May, it hit $250,000 in fundraising! Set on beautiful Lake Spivey, all donations from this inaugural swim went directly to the Aflac Cancer and Blood Disorders Center at Children’s Healthcare of Atlanta. The second youngest in the SAA family, SAA Nantucket, was not to be outdone by its baby sib, though. In only it’s second year, Nantucket flew past its fundraising goal like Phelps by the competition and raised $180,000. The 55% jump in fundraising can be attributed to the dedication of all the swimmers that make this late summer event a blast! SAA Chicago debuted a new event at their swim this year in addition to their ½, 1, 1½ or 3 mile distance choices. The new Relay Swim across Lake Michigan was a hit, and helped the already firmly established swim raise almost $400,000 for the Rush University Cancer Center this past July. The Michael Phelps Swim School also partnered with Swim Across America this year to offer the new Breakowt clinics to swimmers in Baltimore and Seattle. The innovative and comprehensive training session brings confidence and skill to new open water swimmers, and was run the day before each SAA swim. Three of our open water swims made us proud as they reached new heights this summer. In tiny Rhode Island, the annual swim at Narragansett hosted a whopping 500 swimmers! A record number for this swim, all proceeds from participants went to Women and Infants Hospital. Some say the Golden Gate Bridge that gleams over the Bay is the main attraction of the SAA San Francisco swim, and apparently a lot of potential participants thought so! The swim sold out all of its spots a week and a half in advance, and raised over half a million dollars. SAA Greenwich followed suit, with over half a million dollars raised for their beneficiary, but they saw one of their tribute teams make history. Team College, a group swimming in honor of college friend Colin Campbell, raised $135,000 alone, which is one of the most amounts ever raised in SAA history. 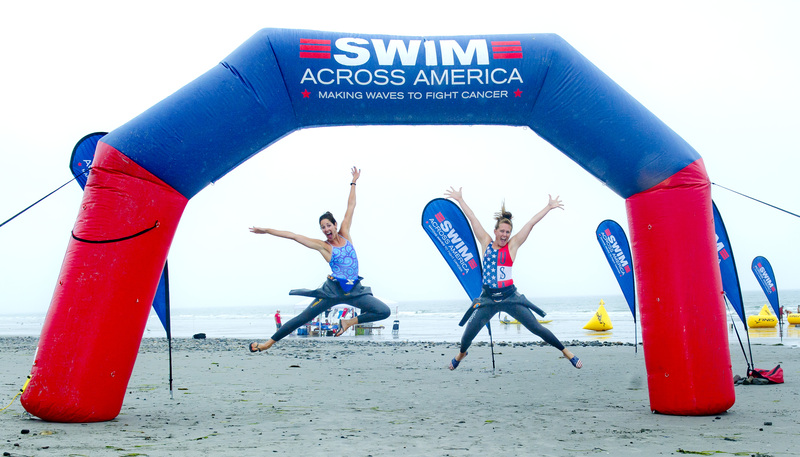 A year of firsts for Swim Across America, we’re proud to say that all of our open water events made waves this summer!